Let it be known - there's probably going to be spoilers in this one. Read on at your own risk. I love Tim Burton. His style is somehow richly colorful while often being very dark and beautifully spooky. He also has this great comic sensibility that few other directors pull off as endearingly. I love that he seems to live in some lovely fantasy world of his own, dropping into our's occasionally to share a slice of what he sees. I also love and respect how he's continually giving great horror actors roles (some times their last.) His appreciation for these aging stars (like Vincent Price, Christopher Lee, and Jonathan Frid) is both charming and inspiring; I wish more directors made such an effort. I actually feel like Burton has been in a bit of a slump recently, kind of 'phoning it in.' Which makes me sad. I don't know how much is pressure from above (i.e. studios say do X and he has to do it) or how much is that he's actually been uninspired. Which brings me to Dark Shadows. Before I really get into the meat of my review, lets do a quick history lesson. Dark Shadows was a soap opera in the late 60's-early 70's. While many people know where the show ended up (featuring vampires, werewolves, witches, time travel, and other assorted paranormal stuff.) most people don't know that the show started off fairly normally. When ratings started to drop the writers did something desperate - introduced a character that was a vampire (to spice things up.) He was only supposed to hang around for a few weeks but he became so damn popular that they just kept rolling with the supernatural elements. The pacing was - throughout it's run - nearly painfully slow. The actors were stilted and awkward. Because they used the same actors (in some cases) for multiple roles, if you missed an episode you could become completely lost; one day someone is "uncle so and so" and the next they are "sir blah blah" and perhaps have a werewolf curse on them. Frustrating? Yeah. But also part of the show's weird charm. It was always an adventure. I loved the show. I think it was Scifi (Syfy to you youngsters.) that aired it when I was in my teens and I watched it all the time. Religiously. I was in love. The show was disproportionately dramatic, weirdly engaging, and different than anything else on TV. Dark Shadows also made it to the big screen a couple of times (in the early 70's.) And experienced a few brief revival attempts on TV. Now it's seeing new life at the hands of Time Burton. Sounds like a recipe for awesome, right? Dark Shadows was like the culmination of Burton's best movies. The overall tone was campy and fun. It completely captured the awkwardness of the original show. There were definitely moments that made me laugh out loud and most of them included the always phenomenal Helena Bonham Carter; she definitely had some of the best quotes in the movie ("Every year I get half as pretty and twice as drunk.") and when she goes down on Johnny Depp - hilarious. The cast was great. I'm a Johnny Depp fan - I just can't help myself. He's a well - rounded and talent actor who throws himself into any role. He played a campy, awkward, and somehow fun-loving vampire with just a hint of anger beneath the surface. Also. Bonus point to Tim Burton for getting Alice Cooper. I love when he turns up in movies. I've heard complaints that the story was lacking. I felt more like it was 'wandering' than lacking. I imagine that's due, in part, to having to pull the double duty of introducing audiences to the story and covering material from some 400 or so episodes. I think my only major complaint was the effects for the werewolf. The movie was wonderfully campy. The werewolf effects were just cheesy and childlike. Amateurish. They belonged in Burton's version of Alice in Wonderland, not in this movie. Okay. It's late and now I'm beginning to wander so, it's wrap up time. 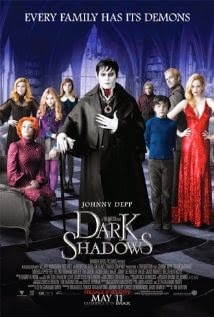 If you're not a fan of Dark Shadows or a fan of Tim Burton, do yourself a favor and don't see this one. But if you're looking for a colorful, cheeky romp through the 70's with Johnny Depp as your host - get to the theatre. Interesting review. I'm in the UK and so never seen the TV show, but I thought the movie was just awful. It had been sold as being full of Beetlejuice-esque manic energy but that wasn't present at all, but the bigger issue is just that the script/story was half-arsed. There are numerous occasions where a character says something along the lines of "David has come to idolise you" and yet David has barely been on screen in the past half hour and hasn't shared any screen time with Depp. Surely we, as an audience, should bear witness to events which convince us that David now idolises Barnabas, rather than accept it on the word of someone else. In a similar way, Barnabas' relationship with 'Vicky' was not dealt with on screen at all - they barely shared the screen for five minutes and yet we're supposed to accept that she loves him. Why? Give us evidence that she feels anything for him as we see nothing on screen (an appeal to Burton, not you!). Overall, I felt the film tried to cram far too much in which meant that no story was properly realised. In fact, many storylines were just 2 or three scenes and that was it. I guess that's what comes when you try to reduce over 1000 episodes of an old soap into a 2 hour movie. Still, it's interesting to read a US take on the movie, given there's some familiarity with the source material and so on.